With the assistance of our dedicated team of professionals, we are providing a premium quality range of Galvanized Trunk. Handcrafted By Expert Artisians Finished, Packed Through WellTrained Workers Under The Supervision of rich Experienced Team members. Galvanized Box is specially design for transferring and storing apparels, accessories and other important articles. we are actively devoted towards providing well tested Steel Trunks. 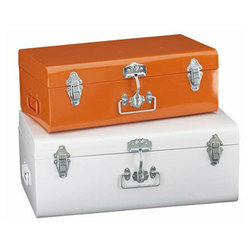 Apt for storage of various products, these trunks are well known due to their striking features. Trunks provided by us are manufactured from qualitative stainless steel that we sourced from the most genuine vendors of the market and sophisticated technology. SIZE : 46 X 56 X 30 CM. 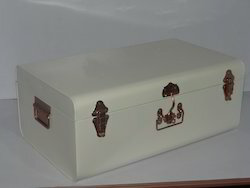 We are offering Military Box to our client's. 35×19×13" inch Size Galvanised trunk used for various purposes. Metal Boxes or Trunks with pad locks are available in various sizes and steel gauge types, starting from 18G to 30G. We offer Steel Trunks that are made from qualitative raw material and have huge storing capacity as per as the requirements. They are available in varied sizes and designs. With honest intentions to improve the standing we have earned in this arena, we are offering a distinct collection of Galvanized Trunks. Immensely valued owing to its reliability, these are highly applauded. Moreover, these could be acquired from us at feasible rates.